The Versys 1000 has actually been produced since 2012, but until now its unconventional styling coupled with a relatively soft U.S. motorcycle market have kept it away from our shores. Motorcycle sales are beginning to show serious signs of growth, with several European manufacturers claiming all-time records for the 2014 model year sales, and long-legged upright sportbikes like Ducati’s updated Multistrada, BMW’s new S1000XR, KTM’s 1290 Super Adventure R, Suzuki’s recently revamped V-Strom 1000 and other liter-plus adventure-themed machines comprise the hottest contemporary segment in motorcycling. Cue the new Kawasaki Versys 1000 LT, a completely re-skinned and updated motorcycle that joins its little 650cc brother in the new world for the 2015 model year. Kawasaki says the Versys 1000 LT retains the “characteristics” and “all the great features” of a Versys 650, and this would be a neat trick if it were true. However, the V1000 is fighting an uphill battle when it comes to comparing “Versys” traits with its nimble middleweight sibling. That’s a deck which was already stacked with ‘fun to ride’ and ‘surprisingly sporty’ references. After all, the Versys 1000’s engine and chassis are significantly wider and feel quite a bit less eager to make quick transitions or otherwise be thrown around. 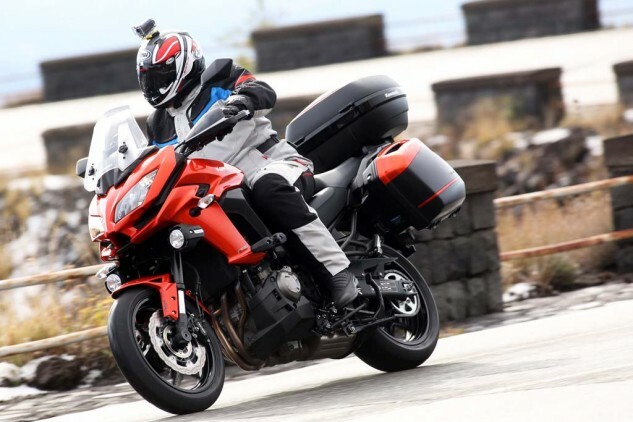 But a similar handlebar placement and long-ish travel suspension like its smaller 650-powered sibling helps the big Versys to rise above its platform mates, the Ninja 1000 and Z1000. 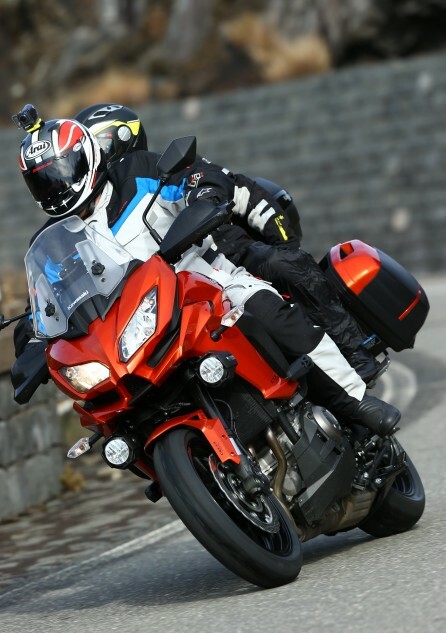 The Versys 1000 LT excels at in the sport-touring role, offering comfortable ergonomics, a strong engine and standard saddlebags. The top case pictured here is an optional accessory. Naturally, the 1000 LT offers a lot more straight-line acceleration than its smaller namesake. It also has an array of electronic aids like KTRC traction control, selectable Full/Low power modes and ABS brakes, plus a larger more-padded saddle to complement its calmer disposition. Name aside, I think it is fairer to think of the 2015 Versys 1000 LT as being more of a traditional sport-touring and long-distance machine instead of a larger version of the Versys 650. Riding the new Versys 1000 all-day through the ancient and beautiful Sicilian countryside revealed it to be quite proficient in the more mature role of “touring” motorcycle. All physical engine and EFI components are directly from the Z1000. Revised power characteristics come courtesy of different ECU programming, which allows the sub-throttle plates in the intake to remain more open at high revs. This noticeably improves top-end performance until its 10,000-rpm redline, which feels a tad too low for this state of tune – the engine seems ready to make additional power even farther up the tach. In Versys 1000 tune, this engine and ECU combo delivers what feels like a curveless torque curve, basically an inclined plane that linearly builds into a more impressive and free-breathing top-end rush than I remember from its duty in the Z1000. The engine in the big Versys is essentially the 1043cc inline-Four from the Z1000 streetfighter but with revised ECU tuning. Like the Z1000, as the revs rise through 7000 rpm, the intake begins to make exciting noises in the form of an urgent inline-Four intake howl that plucks all the right emotional notes. It may not surge and rush in the exciting manner of a superbike, but it definitely sounds aggressive in the right conditions. That’s not to say it’s slow. No sir, the Versys 1000 is fast in the same way all user-friendly motorcycles with 120+ horsepower are fast … it accomplishes fast by pulling steadily and not doing anything unpredictable that might spook its rider into closing the throttle. Those are actually great traits for any engine intended for practical real-world use and/or long days in the saddle. While we’re on the subject of practicality, the Versys 1000 LT brings wind/rain-deflecting hand guards, standard locking hard saddlebags, and its electronic rider aids. Also practical is its center stand that pops the V1000 up with an easy step and light one-handed tug. However, it can clunk audibly when bounced over cobblestone roads. Finally, Kawasaki’s seemingly ubiquitous Economical Riding Indicator (ECO), which allegedly illuminates to indicate when the 1000 LT is being ridden like a fuel-sipping baby, is something I can’t confirm thanks to my well-exercised right wrist. 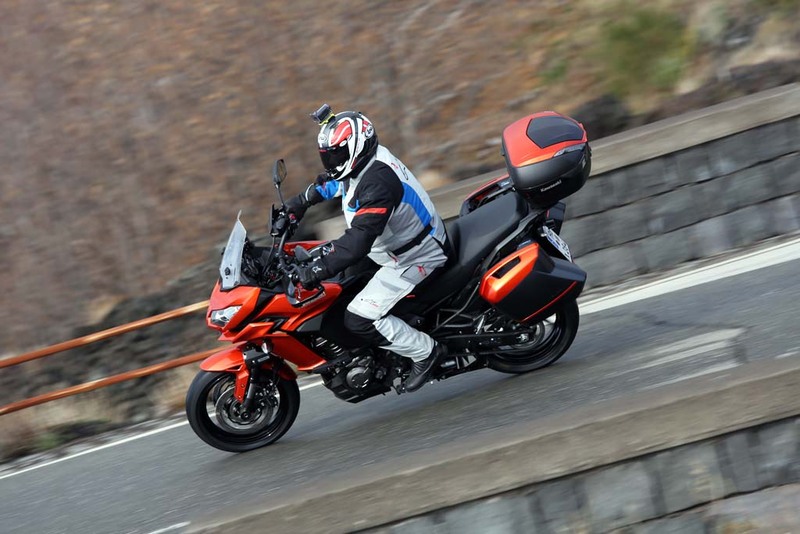 The Versys 1000 LT is a good fit for large riders like Sean. Much like the Ninja 1000, the Versys’ frame is made from five pieces of cast aluminum, but the steering head angle and engine mounts have been revised to yield a 27.0-degree rake angle, 2.5 degrees lazier than the Ninja 1k’s; a 4.0-inch trail figure is identical. Its two upper engine mounts are rubber isolated, while its bottom two are rigid. 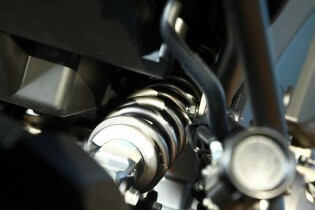 Despite Kawasaki’s best efforts, this inline-Four can occasionally produce a grating vibration which can be felt through the pegs at highway cruising speeds. This is a family trait shared with the LT’s 1043cc-powered stablemates, the Ninja 1000 and Z1000, which is unfortunate in a long-distance motorcycle like the Versys 1000 LT, especially considering the addition of those rubber upper mounts. One of the many nice features of the 2015 Versys 1000 LT is its use of a clutch that features a mechanical assist and slipper design, which helps squeeze the friction plates during acceleration, yet reduces clamping force on deceleration. This allows for the use of lighter clutch springs than would otherwise be necessary to handle the engine’s torque, thereby reducing effort at the lever, while also acting somewhat like a racing “slipper” clutch during aggressive downshifts. I love the testing and analysis of motorcycles, and though it was immature and not exactly necessary, I couldn’t help but to try to upset the rear contact patch by deliberately shifting into too low of a gear at high speed and then dumping the clutch with the throttle closed. The tire only chirped slightly, then the clutch’s slipper ramps spread the plates and allowed enough free rotation to reduce back-torque to levels the tire could handle. 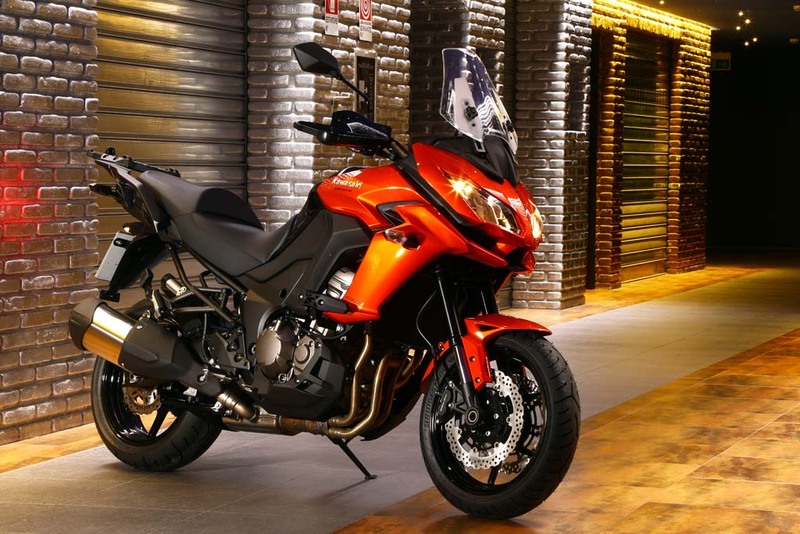 The Versys 1000 LT features a contemporary new face that is far more attractive than the homely previous version which was never offered in the U.S. Speaking of deceleration, the V1000 uses traditional-mount four-piston Tokico front brake calipers that lovingly squeeze its two 310mm front rotors. Initial bite is gentle, and the traditional caliper mounting, rubber brake hoses, and conservative brake pad selection all help provide perhaps its most “Adventure bike” like trait: easy modulation with a predictable feel that rarely requires ABS intervention. After using them to successfully avoid just about every possible Sicilian driver, I would now have no hesitation to use this same setup in the dirt … bodywork costs aside. As our ride group meandered through several quaint Sicilian cittas, we mixed with some fairly reckless local traffic – through roundabouts, over lumpy cobblestones and at narrow right-angle intersections. Through it all, the 1000 LT remained perfectly docile, as seems to be its nature. Really, my only in-town complaint was some low-rpm abruptness when re-applying throttle from its closed position. Otherwise, fuelling is seamless and predictable. Room for two and their non-emotional baggage, especially when equipped with the accessory top case that provides a reassuring backrest for your pillion. The 1000’s 549-pound curb weight (with 5.5 gallons of fuel) and rangy chassis setup help instill it with a bit more low-speed stability compared to a V650. Thankfully, despite its extra size and weight, the 1000 remains delightfully docile and easy to ride at parking-lot speeds, not displaying any top-heaviness when making U-turns or trolling through the narrowest Sicilian alleyways. 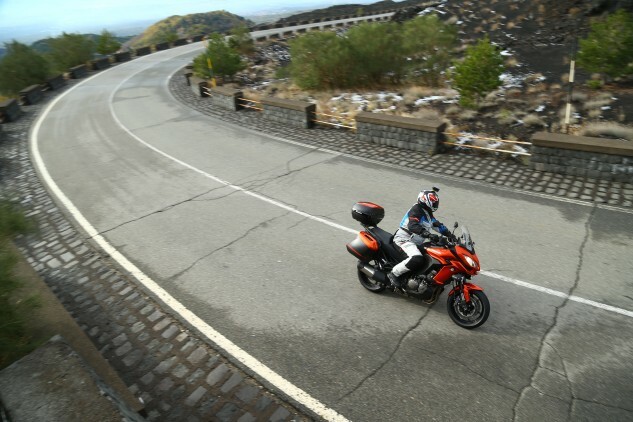 Even with its extra stability, the new Versys 1000 LT still benefits from a light touch of rear-brake dragging while negotiating the tight/wet corners along the volcanic slopes of Mt. Etna. This technique has always had a remarkably calming effect on the Versys 650, and it is interesting how the 1000 LT shares a little of that peculiarity, especially considering the dissimilar chassis layouts of the two machines. Now, when I say dragging the rear brake, I’m not actually talking about braking to slow down, just using a little toe pressure on the right pedal to generate some extra drag out back and perhaps induce a bit of suspension squat. Lift that toe off the brake and the 1000 LT frees-up a bit, while still remaining stable enough to inspire confidence in nasty conditions. The Versys’ rear shock features hydraulic preload adjustment and a rebound-damping adjuster but no provisions for compression-damping changes. Its compliant ride and manageable demeanor can be partially attributed to its well-sorted suspension components. The front is handled by a 43mm KYB Separate Function inverted fork with a rebound-damping adjuster (top of right fork leg) and external spring preload adjuster (top of left fork leg). The horizontal back-link rear shock is also adjustable for rebound and spring preload, but its aft-facing remote spring preload adjuster is tucked between and slightly recessed behind the right-side passenger’s heel guard and the bottom tube of the subframe. This peculiar orientation and tight packaging can make it easy to bang your knuckles while adjusting preload, and those adjustments may take several turns of the knob, as minor twists didn’t appear to have much effect on rear suspension sag. For me, it took three full turns clockwise (more firm) before things began to gel into the comfortable and capable zone. Like the Versys 650 models, a complete lack of compression damping adjustability marks these components as budget-conscious items. They do, however, work quite well, a fact that, along with the tires, probably provides the most significant contribution to this bikes stable and friendly personality. Its Bridgestone Battlax T30 Sport Touring tires offer a wide performance envelope, long treadlife, and even generated enough wet grip to rarely require intervention from the KTRC traction control. Then again, the KTRC was set to Mode-1 (maximum dry performance/minimum TC intervention) throughout our test, since the pace was moderately quick and I’m just hard-headed enough to prefer not to be retarded by too many electronic nannies. 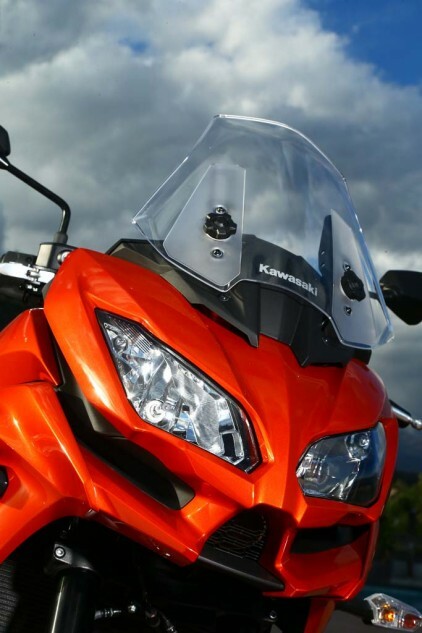 The windscreen of the Versys is adjustable over a 2.76-inch range. Like the 650 version, the 1000 LT features aggressively angular new bodywork with a fairing upper featuring twin headlights. Kawasaki’s design goal was to give the Versys line more of a “Kawasaki Face” than previous models and make them look more like the Ninja supersports. I’ve never been very concerned with styling, but I have to admit this design looks significantly better than the older Versys’ stacked headlight designs. 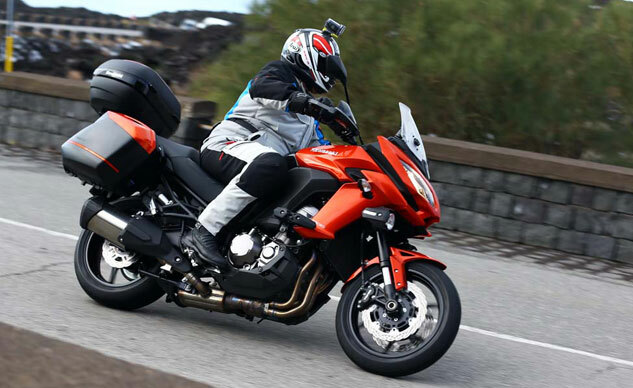 The 2015 Versys line was designed to easily integrate the handsome single-key Kawasaki Quick Release (KQR) hard bags, which were first introduced as accessories for the 2014 Ninja 1000 and are now standard equipment on this new 1000 LT. Those KQR bags can also be combined with an optional same-key KQR 47-liter Top Case for a total capacity of 103 liters. Like most modern designs, the bags are quick and easy to mount and remove. 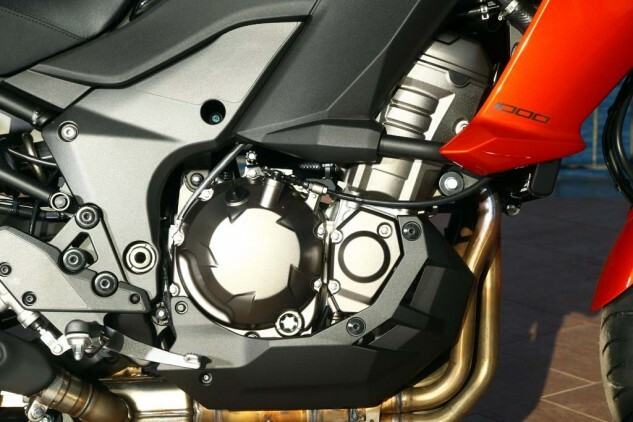 When running without the bags, the mounts blend into the subframe so as not to compromise the bike’s appearance. So there you have it. This isn’t an overgrown Versys 650 at all. The Versys 1000 LT is the most usable motorcycle in the Ninja 1000/Z1000 triad. And, with an extremely competitive MSRP of $12,799, fully equipped, its value-per-dollar score is quite lofty.